Click the links immediately below to view the other strategy sections. There are two argument sections; together they comprise one-half of the LSAT. Each section is 35 minutes long and contains roughly 24 questions. This section is not as highly “timed” as the games, so it is reasonable to set as your goal the completion of the entire section. Unlike with games, determining the level of difficulty of an argument is itself difficult, so just start with the first question and then work through the section. An argument, as used on the LSAT, is a presentation of facts and opinions in order to support a position. Many arguments will be fallacious. And many correct answers will be false! This often causes students much consternation; they feel that the correct answer should be true. But the arguments are intended to test your ability to think logically. Now logic is the study of the relationships between statements, not of the truth of those statements. Being overly concerned with finding the truth can be ruinous to your LSAT logic score. Creating a good but incorrect answer-choice is much harder than developing the correct answer. For this reason, usually only one attractive wrong answer-choice is presented. This is called the “2 out of 5” rule. That is, only two of the five answer-choices will have any real merit. Hence, even if you don’t fully understand an argument, you probably can still eliminate the three fluff choices, thereby greatly increasing your odds of answering the question correctly. This interactive, comprehensive self-study course presents the equivalent of over 600 pages of printed material, including hundreds of LSAT examples, problems, videos, and feedback from LSAT experts to your questions. All for only $29.95! Click here to view the course. Ask Questions! Our experts monitor StudyDesk to answer your questions. Videos: Hundreds of videos guide you through the concepts and examples. Statistics: Your performance on the exercises and tests is saved and you may review your performance and check solutions at any time. Although in theory the questions on the LSAT argument section are designed to be answered without any reference to formal logic, the section is essentially a logic test. Some knowledge of the fundamentals of logic, therefore, will give you a definite advantage. Armed with this knowledge, you should quickly notice that the arguments are fundamentally easy and that most of them fall into a few basic categories. In this section, we will study the logical structure of arguments. Most argument questions hinge, either directly or indirectly, on determining the conclusion of the argument. The conclusion is the main idea of the argument. It is what the writer tries to persuade the reader to believe. Most often the conclusion comes at the end of the argument. The writer organizes the facts and his opinions so that they build up to the conclusion. Sometimes, however, the conclusion will come at the beginning of an argument, rarely does it come in the middle, and occasionally, for rhetorical effect, the conclusion is not even stated. A conflict of interest exists between the blacks and the police because the police are the armed guardians of the social order and the blacks are the chief domestic victims of the American social order. The police are the armed guardians of the social order. So a conflict of interest exists between the blacks and the police because the blacks are the chief domestic victims of the American social order. It is generally awkward, as in the previous paragraph, to place the conclusion in the middle of the argument because then it cannot be fully anticipated by what comes before nor fully explained by what comes after. On the rare occasion when a conclusion comes in the middle of an argument, most often either the material that comes after it or the material that comes before it is not essential. In summary: To find the conclusion, check the last sentence of the argument. If that is not the conclusion, check the first sentence. Rarely does the conclusion come in the middle of an argument. When determining the meaning of a conclusion, be careful not to read any more into it than what the author states. Although arguments are not worded as precisely as games, you still need to read them with more care than you would use in your everyday reading. At 608 pages, MASTER THE LSAT offers the most comprehensive and rigorous LSAT test prep available. Law school is expensive enough without paying hundreds of dollars to prepare for the admissions test. Nova’s Master the LSAT is the best kept secret in LSAT prep — it provides the most comprehensive, rigorous, and proven effective LSAT prep available, for a ridiculously low price! Nova’s Master the LSAT includes a thorough analysis of basic logic principles guaranteed to show up on the LSAT, tons of LSAT questions that cover every type of test question, and 4 full-length, official LSAT exams with thorough explanations for each problem. This 608-page book is proven to make even the weakest, most terrified test taker a master of the LSAT exam and confident to boot! LSAT Games: Thorough analysis of every type of game that has appeared on the LSAT, with step-by-step strategies for solving each type of game. LSAT Arguments: Discover the underlying simplicity of these problems and learn to recognize common answer patterns. LSAT Reading Comprehension: Develop the ability to spot places from which questions are likely to be drawn as you read a passage. 4 Official LSAT Tests! Thorough analysis of four official LSATs, with all correct and incorrect answers explained in detail. If you’ve got the motivation to keep after it, this book will easily replace the $1,000 course you thought about taking…I took a practice test one month ago and scored a 158. Now, 300 pages through this book, I’m scoring around a 172. I read another prep book and took a practice LSAT. My score was 148. After using this prep book… I was practice testing at 168. This is a must buy book. I used this book for about an hour to an hour and a half a day for 30 days preceding the LSAT. I read it thoroughly and took the practice test and practice problems under simulated test conditions and scored in the 99.3 percentile! Using the course of study suggested in this book, I was able to achieve a competitve score for admission into each of my law school choices, including #7 ranked University of Michigan. If I had to take the LSAT over again, I wouldn’t do it without a review of this book. And can you believe it? All this for only $29.95! Since the incumbent’s views are out of step with public opinion, he probably will not be reelected. Here “since” is used to flag the premise that the incumbent’s positions are unpopular. Most arguments depend on one or more unstated premises. Sometimes this indicates a weakness in the argument, an oversight by the writer. More often, however, certain premises are left tacit because they are too numerous, or the writer assumes that his audience is aware of the assumptions, or he wants the audience to fill in the premise themselves and therefore be more likely to believe the conclusion. Conclusion: I knew he did it. Premise: Only a guilty person would accept immunity from prosecution. The suppressed premise is that he did, in fact, accept immunity. The speaker assumes that his audience is aware of this fact or at least is willing to believe it, so to state it would be redundant and ponderous. If the unstated premise were false (that is, he did not accept immunity), the argument would not technically be a lie; but it would be very deceptive. The unscrupulous writer may use this ploy if he thinks that he can get away with it. That is, his argument has the intended effect and the false premise, though implicit, is hard to find or is ambiguous. Politicians are not at all above using this tactic. A common question on the LSAT asks you to find the suppressed premise of an argument. Finding the suppressed premise, or assumption, of an argument can be difficult. However, on the LSAT you have an advantage–the suppressed premise is listed as one of the five answer-choices. To test whether an answer-choice is a suppressed premise, ask yourself whether it would make the argument more plausible. If so, then it is very likely a suppressed premise. American attitudes tend to be rather insular, but there is much we can learn from other countries. In Japan, for example, workers set aside some time each day to exercise, and many corporations provide elaborate exercise facilities for their employees. Few American corporations have such exercise programs. Studies have shown that the Japanese worker is more productive than the American worker. Thus it must be concluded that the productivity of American workers will lag behind their Japanese counterparts, until mandatory exercise programs are introduced. The conclusion of the argument is valid if which one of the following is assumed? (A) Even if exercise programs do not increase productivity, they will improve the American worker’s health. (B) The productivity of all workers can be increased by exercise. (C) Exercise is an essential factor in the Japanese worker’s superior productivity. (D) American workers can adapt to the longer Japanese work week. (E) American corporations don’t have the funds to build elaborate exercise facilities. The unstated essence of the argument is that exercise is an integral part of productivity and that Japanese workers are more productive than American workers because they exercise more. The answer is (C). When presenting a position, you obviously don’t want to argue against yourself. However, it is often effective to concede certain minor points that weaken your argument. This shows that you are open-minded and that your ideas are well considered. It also disarms potential arguments against your position. For instance, in arguing for a strong, aggressive police department, you may concede that in the past the police have at times acted too aggressively. Of course, you will then need to state more convincing reasons to support your position. I submit that the strikers should accept the management’s offer. Admittedly, it is less than what was demanded. But it does resolve the main grievance–inadequate health care. Furthermore, an independent study shows that a wage increase greater than 5% would leave the company unable to compete against Japan and Germany, forcing it into bankruptcy. The conclusion, “the strikers should accept the management’s offer,” is stated in the first sentence. Then “Admittedly” introduces a concession; namely, that the offer was less than what was demanded. This weakens the speaker’s case, but it addresses a potential criticism of his position before it can be made. The last two sentences of the argument present more compelling reasons to accept the offer and form the gist of the argument. Don’t waste hundreds, even thousands of dollars paying a test prep company to prepare you for the LSAT. Now, you can get the same preparation in a downloadable software program for less than a fraction of the cost! The LSAT is a logic test. Although this makes the test hard, it also makes it predictable–it is based on consistent, fundamental principles of logic. LSAT Prep Course Software analyzes and codifies these basic principles, teaching you how to apply them and master even the most challenging LSAT questions. Worried about how well “LSAT-style” questions from other prep companies prepare you for the actual LSAT? Your worry ends here! Nova’s LSAT Prep Course Software includes 3 actual retired LSAT exams, plus detailed explanations for every question! Master the LSAT and significantly improve your score with LSAT Prep Course Software. At only $29.95, you can’t afford not to try it! Lessons: Numerous lessons and exercises provide comprehensive review of the principles of logic needed for the LSAT. Test-taking strategies: Learn how to recognize what logical principle is being tested and how to spot the correct answer. Mentor Mode: In this interactive mode, receive immediate feedback on your answers and view detailed explanations of the solutions. 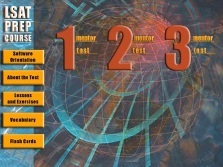 Test Mode: Take a timed test scored by the program. Learn the average LSAT scores of 153 ABA approved law schools. Order and Download LSAT Prep Course Software (Windows) for $29.95 and start studying today!